Soft, plump lips that curve into a beautiful smile enhance the charm of your face. You might spend hours looking through various lip colors and lip gloss for that perfect shade. However, try as you may; you can’t get the naturally perfect lips you dream of. Not-so-perfect lips are a constant source of misery for every girl. The lips are one of the visual focal points of your face. Beautiful lips not only give you a youthful look and a lovely smile, but they also make the application of makeup easier. Dry, dull, flaky, chapped or sunburned lips do just the opposite. 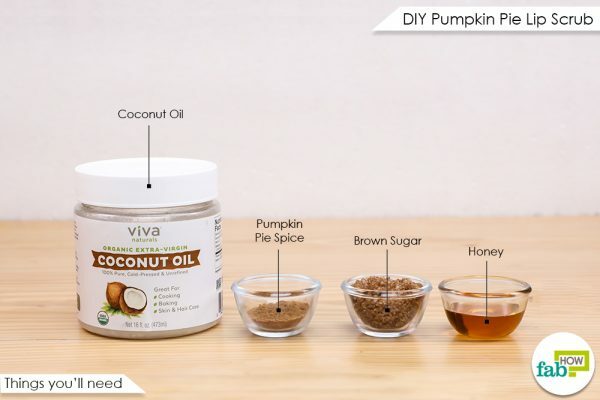 Instead of using store-bought lip care products, we recommend this highly effective DIY Pumpkin Pie Spice lip scrub. The skin on your lips is thin when compared to the skin on the rest of your body. Lip balm alone is not going to get rid of your lip problems or maintain their beauty. What you need is regular exfoliation of your lips to make them healthy, soft and naturally pink. Exfoliation prevents accumulation of dead skin cells and removes any dry patches from the lips. 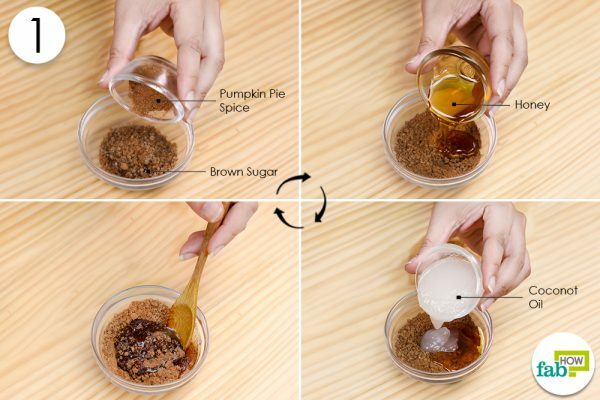 This DIY lip scrub is perfect for the job, and it’s got pumpkin pie spice flavor! Who doesn’t love the aroma of pumpkin pie and the fall memories it brings with it? Shhhh... Worry not if you have no clue about pumpkin pie spice. It refers to all the spices that can be used in a pumpkin pie like cinnamon, nutmeg, allspice, and ginger. You may buy them already blended or make the spice from scratch and tailor it as per your preference. Moreover, we can assure you that once you’ve made it yourself, you may never repurchase the prepared blend again! The toughest part about this lip scrub will be trying not to lick it all off your lips! Put 2 tablespoons of brown sugar and 1 teaspoon of pumpkin pie spice in a bowl. Add 1 tablespoon each of honey and coconut oil to it. Transfer the mixture to a covered jar or container and store it in a cool, dry spot. Apply it on your lips with your finger and gently rub it back and forth. Rub it in small, circular motions for about 30 seconds before rinsing it off with lukewarm water. Isn’t it a lovely way to have soft lips? Say goodbye to store bought scrubs and go all natural! After all, why use products containing chemicals when you can easily make an all-natural lip scrub that’s as delicious as it is beneficial. 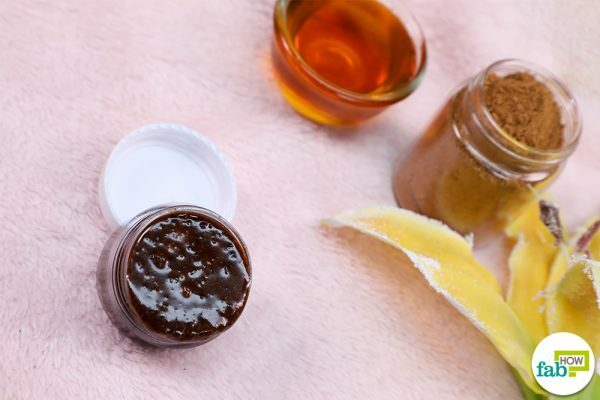 So whether your lips are dry, chapped or need some extra TLC, we suggest you try this fantastic lip scrub and add the extra charm to your face with naturally appealing soft lips. Here’s to having soft lips all year-round, ladies! 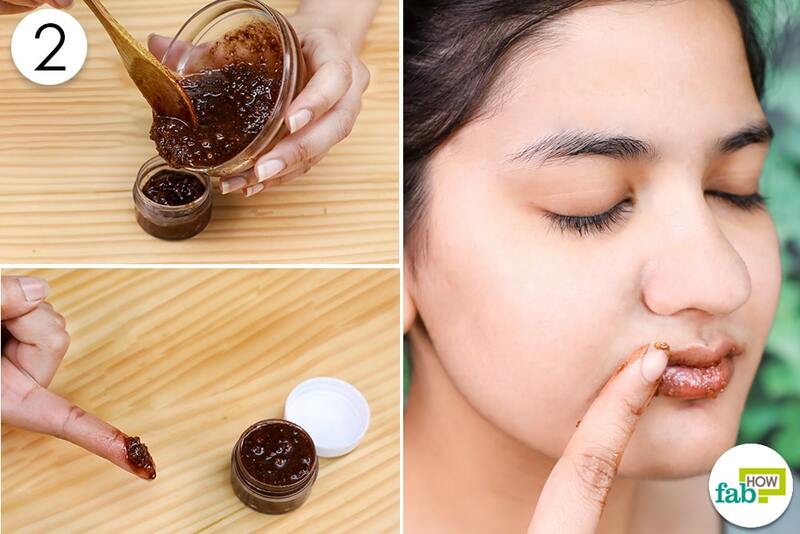 You only need four readily available ingredients for this DIY homemade Pumpkin Pie Spice lip scrub. Pumpkin pie spice is a blend of spices that are rich in vitamins, antioxidants, and fatty acids. These properties make pumpkin pie spice moisturizing, rejuvenating and skin-healing – perfect for dealing with your lip problems. Apart from the spice, the other ingredients used in the scrub are highly beneficial for your lips as well. Coconut Oil is the go-to natural skin care solution because of its moisturizing effect. It is considered a natural emollient. Emollients are non-cosmetic moisturizers that trap the moisture in the skin. Coconut oil is also the best available natural antioxidant. Other benefits of coconut oil include its potential disinfecting and antimicrobial properties that help keep your lips germ-free and thereby protect any broken skin from becoming infected too. Furthermore, coconut oil is anti-inflammatory, which helps reduce swelling. Coconut oil is also used in wrinkle treatments. So when you use the oil in the lip scrub, you are helping the skin around your lips look smoother and more radiant. Honey is rich in bleaching agents, so it helps lighten dark lips. It will also help get rid of the dry, flaky or dead skin from the lips, so your lips are softer and look brighter. Being a humectant, honey has a natural ability to hold onto water. It can hydrate the skin without creating an oily feel. The alpha hydroxy acids present in honey encourage exfoliation. This helps the skin absorb the moisturizing elements. The brown sugar used in this scrub is an excellent exfoliator. Keep yourself hydrated. Constant hydration will help retain moisture and prevent dryness of lips. Before using the lip scrub, moisten your lips by splashing some water on them. Wetting them prevents abrasive friction. Be gentle and exfoliate as needed – not more than twice a week. Overdoing it can cause unwanted irritation.